From his previous career at IBM, Adams was familiar with the Baldrige Excellence Framework, produced by a federal program within the Commerce Department’s National Institute of Standards and Technology. IBM’s Rochester plant had earned a Baldrige Award in 1990. Adams recognized the framework as “a potential tool to use to improve government performance,” he said. 5. Improve data usage for better decision-making and investment resources. As part of a yearly planning process, each department now submits a CFG plan with goals that align with state government objectives. Under the banner “Transparent TN,” Adams added, “a subset of our milestones and metrics are posted on our website.” Among results the government is proud to have earned is a “Triple A” bond rating from all three rating agencies (achieved by only 11 states). Adams credits the Tennessee Center for Performance Excellence (TNCPE) with supporting use of the Baldrige framework in the state. 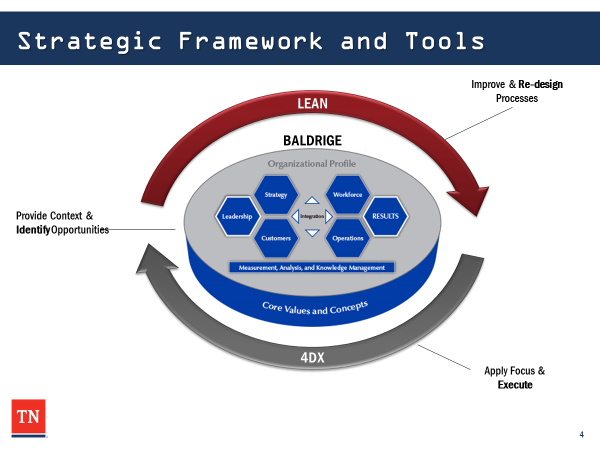 The nonprofit is among state and regional partners of the Federal Baldrige Performance Excellence Program. “We had a strong foundation with the TNCPE,” Adams said. He pointed out that two state commissioners on TNCPE’s board of directors have pioneered adoption of the Baldrige framework within their departments. 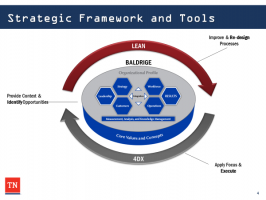 “Having Commissioners [Rebecca] Hunter [Department of Human Resources] and [John] Dreyzehner [Department of Health] on the TNCPE board made it easier to deploy the Baldrige framework [more widely],” said Adams. In 2016 alone, the Tennessee Department of Health earned an advanced level Achievement Award through TNCPE’s assessment and recognition program, and the Tennessee Department of Human Resources earned an intermediate-level Commitment Award. In addition, two county health departments earned Commitment Awards, and 24 other county health departments or districts earned beginner level Interest Recognition in 2016. As an example, Dreyzehner described the work of Micky Roberts, who led a county health department to earn a TNCPE Achievement Award for making its operations more efficient and effective using Lean and the Baldrige framework. Today, Roberts serves as deputy assistant commissioner for policy, planning and assessment for the state health department, where he continues facilitating performance improvement. Highlighting results of his department’s Baldrige-based approaches, Dreyzehner described outcomes from improving a program to reduce smoking by pregnant women. “We looked at our results and discovered one barrier to success for women in the program was being around other household members who smoked,” he said. Dreyzehner also described a statewide reduction in the overprescribing of opioids through his department’s use of a cross-functional team to address the problem—an approach he linked to use of the Baldrige systems perspective and measurement imperative. In 2016, Tennessee demonstrated best-in-class performance on reducing morphine milligram equivalents, and the National Safety Council identified it as one of only four states making progress in relation to six indicators of opioid abuse prevention. Author: Christine Schaefer is a staff member of the Baldrige Performance Excellence Program. She currently leads the team that manages publications, communications, the Baldrige Award process and other assessments, and training. She has a bachelor’s degree from the University of Virginia in political and social thought and a master’s degree from Georgetown University, where her studies focused on public policy issues.